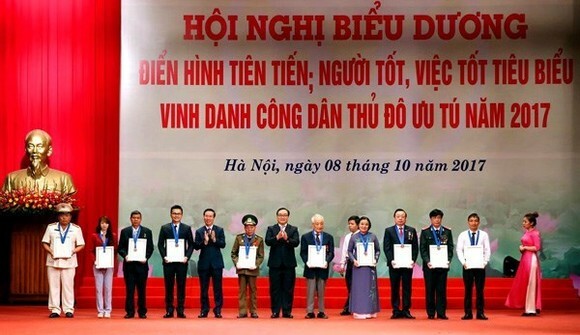 Authorities of Hanoi held a meeting on October 8 to honour the 10 outstanding citizens of the capital city in 2017 and 790 role models in all aspects of life. The 10 eminent citizens include Chairman of the Hanoi Traditional Medicine Association physician Nguyen Hong Siem, who has conducted a number of valuable scientific studies. Wushu artist Duong Thuy Vi was also commended for her numerous achievements, including gold medals, at many regional and international tournaments such as the Southeast Asian (SEA) Games in 2013, 2015 and 2017, the world wushu championships in 2013, and the 2014 Asian Games. Meanwhile, photographer Le Vuong, a member of the Hanoi Union of Literature and Arts Associations, is still working although he retired in 1985. His tireless efforts have resulted in a huge number of Hanoi-themed photos which include many rare images of the city’s Old Quarter and cultural activities. Another citizen honoured this year is Sen. Lt. Col. Dao Anh Tuan, deputy head of the police division for criminal hunting of the Hanoi Department of Public Security. He has spent 20 years working as criminal police and almost 10 years specialising in criminal hunting, excellently fulfilling all the assigned duties. 2017 is the 25th year Hanoi has carried out the “Good persons, good deeds” movement. About 790 of the 11,250 people with good deeds recognised by local authorities received praise from the Chairman of the municipal People’s Committee this year. Speaking at the meeting, Chairman of the Hanoi People’s Committee Nguyen Duc Chung said the capital city has made substantial changes and great strides in all socio-economic areas. Over the last 25 years, more than 24,000 persons with good deeds have been honoured by municipal authorities while over 32,000 people have been rewarded by administrations at the district level. In the time ahead, Hanoi will pay more attention to people directly engaging in good deeds while stepping up communications to expand the “Good persons, good deeds” movement, he added.